These appetising, walnut-shaped morsels are always part of the Turkish mezze. They are best served hot, but are also quite good at room temperature and also ideal for a picnic. 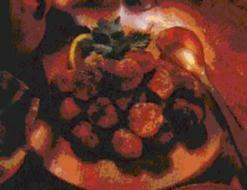 In Turkey or Cyprus minced lamb is used, but beef or a mixture of both will do. Squeeze out excess water from the soaked bread, leaving it quite dry. Combine all the ingredients for the Köfte in a bowl and mix well. Make walnut-shaped balls and keep them covered until they are to be eaten. Then roll them lightly in flour and fry in hot oil for 2-3 minutes until golden all over. They can be shallow -or deep- fried.